Throughout 2016, Bell’s Network team has undertaken both a process and a culture transformation that ultimately allows Bell to provide customers with increasingly innovative products and services. At the helm of this change is Tamer Shenouda, Director of Network Technology and now co-chair of the People and Process group within Facebook’s Telecom Infra Project. We sat down with Tamer to learn more about this transformation, it’s impact on customers and how Bell came to be involved in the Telecom Infra Project. Tell us about what you do and your role at Bell. Tamer Shenouda: I lead the Network Transformation team here within Network, which defines the strategic direction we want our teams to move in. 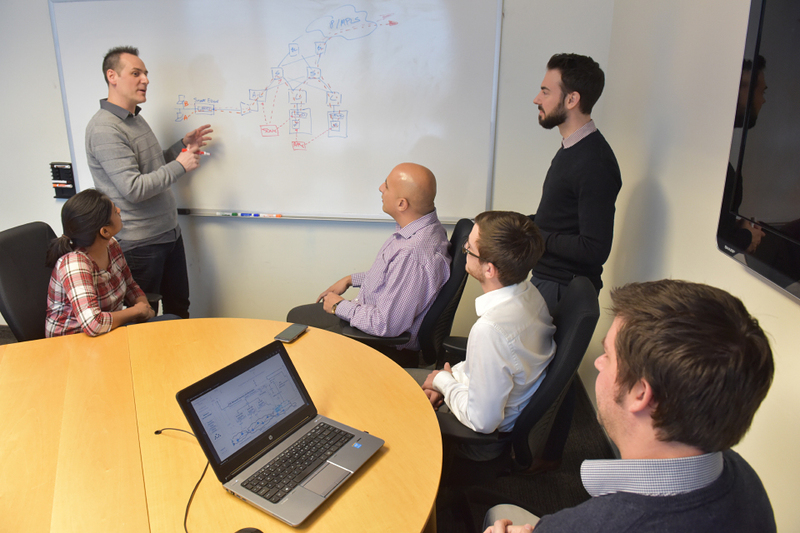 An important element of my role is giving other teams at Bell an understanding of the transformation process and helping to ensure that all of our business units are aligned. Tell us about Bell’s Network 3.0 transformation. TS: Network 3.0 is about transforming people, process, and technology. We aim to change our culture and the way that we work in order to face current and future challenges, while producing the most innovative products and services for our customers. There is a lot of great collaboration happening across the organization. We’re looking to harness that transformation together to help ensure we can learn best practices from each other. The speed of change in our industry is continuously accelerating. We are experiencing increasing competition from global over-the-top services, as well as telecom service providers from outside of Canada. We are also experiencing exponential growth in customers’ bandwidth requirements, which will likely continue with the increasing number of connected devices. Consequently, we’re being challenged on both the services and connectivity sides of our business. These challenges sparked our transformational approach, which is much larger than just continuous improvement or change management. A lot of it comes down to training the right leaders with the right skills and the right mindset – collaboration, creativity, and flexibility are key. It’s an incredibly exciting time to join the team. What are some of the challenges you face in your role and how do you work through them? TS: One challenge that I face in my role is getting people to see situations from different perspectives; this led to our adoption of the “go and see” concept at the heart of our transformation. It’s important that our team members go and see how others are working, both internally and externally in the industry, so that we can share, learn and innovate. Internally, one of the ways we’re increasing collaboration and innovation is through cross-functional initiatives. The initiatives bring individuals together from across the organization to work towards a single objective that creates value for our customers. We then draw a ‘sandbox’ around what they can and cannot do and then let them figure out the rules and approach for solving the problem. This approach is very different than the traditional “Waterfall Model” where different groups handle their own portion of the solution and then hand off their output to the next team. Transparency and collaboration are vital to breaking down silos within organizations. Another challenge that we face is the cynicism towards the concept of people and process transformation. Some people hear “transformation” and think of it as another “X-methodology” or “X-program” that will die off in a few months. It’s important to recognize that this isn’t a flash-in-the-pan concept; it’s an ongoing process focused on transforming our culture and improving the way we work together as a team. What are you doing within your teams to change the culture at Bell? TS: Our cross-functional initiatives are the flagship for our culture change. When employees see and experience what it’s like to work together as a team – focusing on the customer, eliminating waste and taking a fact-based approach – then the culture starts to change. Currently, we have two strategies for change. Our “outside in” strategy is about hiring people external to the organization that already have the core values and skills that our transformation requires. Our “inside out” strategy is about change coming from within through leadership, coaching and learning programs. TS: In the morning, it’s important for me to block time to evaluate where things are personally, with my team and the with the Network 3.0 transformation in general. I also like to be in motion while I do it, so walking helps me with the thought process. After that my day varies – no two days are the same. I make a point to go and learn with the teams that are delivering the foundational components of our Network transformation; it’s a great opportunity to share and learn from one another. Bell is the first Canadian carrier to join Facebook’s Telecom Infra Project. What has that been like? TS: We’re happy to have the opportunity to co-chair the People and Process group alongside Facebook, which is a company known for their employee culture. This initiative is about determining best practices that make our organizations nimbler, which allows us to deliver services to market faster and at a cheaper cost. Talent Management: We’re focused on how we get the right talent into our companies and how we get the existing talent to re-focus on the values and skills that we need within the organization. Cultural Transformation: We’re currently trying to create references so that other companies can learn from what we’ve been doing and bring these strategies back to their organization. Incentives: We know that incentives and compensation are key drivers to employee behaviour. We’re focused on the connection between rewarding and compensating employees and how it aligns with the culture we want to build within our organization. What was the greatest piece or pieces of advice you’ve ever received? TS: “Where focus goes energy flows.” If you’re able to focus your mind on what you want to accomplish, keep that focus and then refresh it constantly, you’ll reach your goal. Interested joining our Network team? To view our open roles click here.